We live in an age of democracy. Modern nations have inscribed the ideals of democracy on their constitutions and similarly august documents. They contend that democracy is the key to unlock humanity’s great potential. People have fought and died for its ideals. Political equality is a foundation of democracy, a pillar on which humanity’s heights rest. Yet, everywhere there is democracy, there is political inequality. Political inequality – as both unequal influence over decisions made by political bodies and the unequal outcomes of those decisions – is felt most acutely by the disadvantaged who remain outsiders to the political system they help to legitimize and whose interests are chronically underrepresented. Governments at all levels are places where access to political power is constrained and where benefits are allocated unequally. 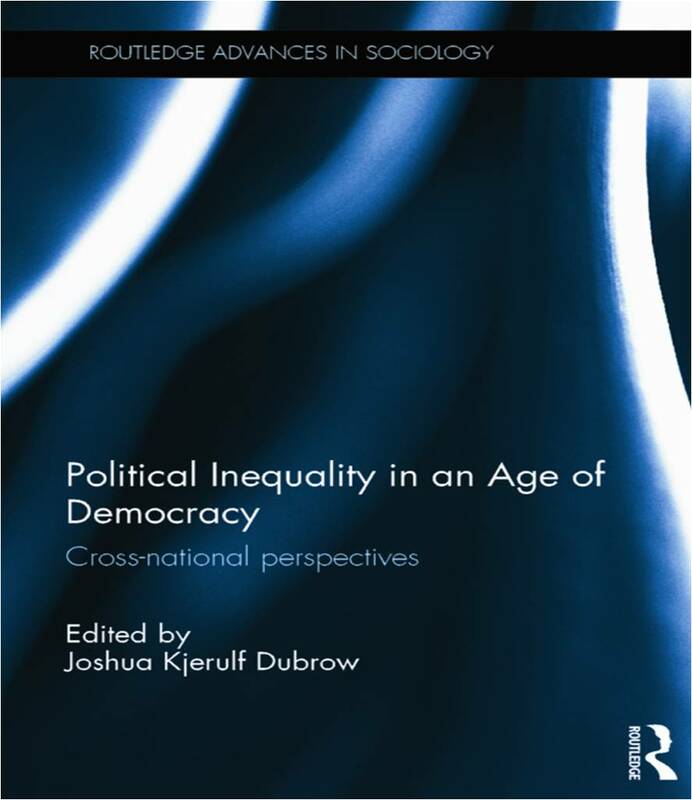 Political Inequality in an Age of Democracy: Cross-national Perspectives builds on previous work (e.g. APSA Task Force in 2004 on inequality and American democracy and Dahl’s On Political Equality of 2006) to address the present and future of the concept of political inequality from multi-disciplinary and cross-national perspectives. It is comprised of nine theoretical, methodological and empirical chapters. This path-creating edited collection contains original works by both established and young, up-and-coming social scientists, including those from Latin America, Eastern Europe, Greece and the U.S.
Alex Afouxenidis, of the National Centre for Social Research, Athens, Greece, received his PhD in Sociology from Durham University in 1989. Since 2002, he has taught Human Geography and European Material Culture at the Hellenic Open University, where he also acted as Chief Researcher of the Euro-Mediterranean Research Unit. Henryk Domanski is Professor of Sociology at the Institute of Philosophy and Sociology, Polish Academy of Sciences (IFiS PAN). His recent work on social class in Europe appeared in the European Sociological Review. He has published numerous books on class and stratification, and is former director of IFiS PAN. Joshua Kjerulf Dubrow received his PhD from The Ohio State University and is an Associate Professor at the Institute of Philosophy and Sociology, Polish Academy of Sciences, and Program Coordinator for Cross-national Studies: Interdisciplinary Research and Training Program (CONSIRT) of The Ohio State University and Polish Academy of Sciences. He is head of the Working Group on Political Inequality, the Committee on Political Sociology (ISA and IPSA). Melanie Hughes is an Associate Professor in the Department of Sociology, University of Pittsburgh. She has recently published articles in the American Sociological Review, American Political Science Review, among others, and coauthored a book (with Pamela Paxton) titled Women, Politics, and Power: A Global Perspective, now in its Second Edition (Sage Publications, 2013). Alfredo Joignant is a Professor of Political Science at Universidad Diego Portales, Chile. He received his PhD from Universite de París I Panthéon-Sorbonne. He is the former president of the Chilean Political Science Association. Matias Lopez is a researcher at the Interdisciplinary Network for Studies of Inequality, Federal University of Rio de Janeiro, Brazil and Managing Editor of ISA’s Current Sociology. Irina Tomescu-Dubrow received her PhD from The Ohio State University and is an Associate Professor at the Institute of Philosophy and Sociology, Polish Academy of Sciences, and Program Manager for Cross-national Studies: Interdisciplinary Research and Training Program (CONSIRT) of The Ohio State University and Polish Academy of Sciences. Solange Simões has a Ph.D. in Sociology from the London School of Economics and Political Science, and a MA in Political Science from the Federal University of Minas Gerais, Brazil. In 2006 she joined Eastern Michigan University with a joint appointment in Sociology and Women’s and Gender Studies, and has also continued to teach in Brazil as a visiting Professor. Kazimierz M. Slomczynski is Professor Emeritus, Department of Sociology and Department of Political Science, The Ohio State University, and Director of CONSIRT. He is the longtime PI of the Polish Panel Survey (POLPAN.org) and is also the PI on Harmonia, a project that harmonizes ex post data from over twenty cross-national survey projects published from the 1960s to 2012. Carlos H. Waisman is a Professor at the Department of Sociology, University of California San Diego. He obtained his Ph.D. in sociology from Harvard University in 1977. His most recent book is Civil Society in Latin America (with Richard Feinberg and Leon Zamosc, 2006). Currently, he is in charge of the Visiting Scholars Program at CILAS.